We stop by Amoritas Vineyards tasting room in Lake Leelanau for a story about love, wine and family. Matt Goodell shared his thoughts on wine labels as he poured me a glass of 2016 Mary’s Folly Field Blend in his family’s tasting room. The light, floral Northern Michigan wine paired nicely with early May’s clear sunlight brightening the room’s spring-green painted walls. Michael Goodell, seated down the bar from me, was sipping a 2016 Hail Mary Riesling. A writer by trade, Michael seems more serious than his easy-going son—until he booms out a couple of laughs. Emily, Matt’s sister, is working several miles away at the family vineyard that rolls across glacial-carved hills in the heart of the Leelanau Peninsula’s cherry and grape-growing country. Matt’s wife, Nora, will be dropping by soon with their 1-year-old son, Magnus. 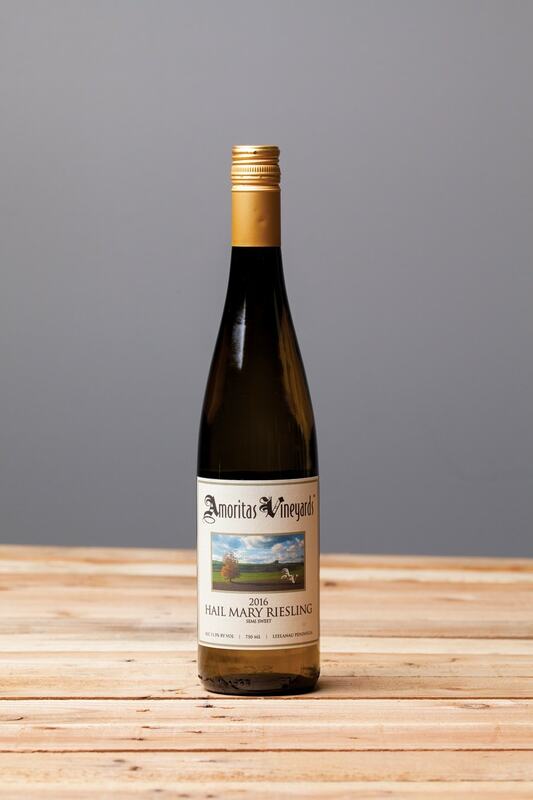 2016 Mary’s Folly is a blend of Auxerrois, Muscat Ottonel and Pinot Blanc—grapes whose vines surround a huge and ancient maple tree. Emily and Matt knew that, beautiful as it is, the tree should have come down before they planted the vineyard because it would steal sunlight and water from the vines. But their mother, Mary, couldn’t part with it. That was back in 2013. Mary had been fighting stage-four cancer for three years. They all loved her far too much to argue about the tree. After Mary was diagnosed in 2010, her family was determined to help her fight the disease with every medical tool at their disposal. And also with love and hope—which is what impelled them to pursue their longtime dream of their own vineyard on the Leelanau Peninsula. The property they ultimately purchased looks out over fields dappled with grazing cows. Rough, craggy hunks of fossilized Petoskey coral peek from the soil and remind of ancient flavors in this terroir. That the address is East Amore Road seemed auspicious: Amore, being Italian for love. The couple combined that word with veritas in honor of the Latin phrase vino veritas—in wine, truth. Amoritas. With Mary helping, the Goodells planted their first vines in 2013. They were the new kids on the Leelanau wine country block with plenty to learn, but the neighboring vineyard owners offered support and advice. But there was no helping the weather. The winters of 2013 and 2014 were brutal in Northern Michigan (remember the ice caves of 2014?). The polar vortex took its toll on the Goodells’ young vines. The next year saw devastation from a very late spring frost and, in August, a straight-line wind that torpedoed off Lake Michigan, flattening swaths of great trees in its path across the peninsula and pelting hail—that cost Amoritas 70 percent of their harvest. Their struggles weren’t over, however. The county highway department nixed their plans for a tasting room at their vineyard because of a sight-distance issue with their driveway. Abandoning their vision of a vineyard-tasting room—and the rock-and-water garden Mary was already working on for it—the Goodells settled for a small white clapboard building on the west side of the village of Lake Leelanau. It was already commercially zoned. It would get better traffic. Mary passed in July of 2016. Steeped in grief, the Goodells oversaw a harvest that year that produced 1,296 cases of wine. The next season saw 600 cases and finally, in December of 2017, they had worked through the bureaucratic hurdles to open their tasting room … in a snowstorm. I stopped into the Amoritas tasting room again in July. Matt’s tan face broke into a crescent smile when he saw me. He was more relaxed than he’d been in May. The summer was still new and their tasting room was already becoming a wine-trail fixture. And people were loving Amoritas wine. Coming away with bottles and memories of the good folks who made it: Emily who carries on her mother’s passion for horticulture in the vineyard; Matt who has her immediate ease with people; Michael who chronicled Mary’s bravery in his book The World Shifted; Nora who radiates motherhood; Magnus’s belly laughs when Matt tosses him in the air. “It’s happenin’,” Matt said with a grin as he handed me my bottle of 2016 Hail Mary Riesling.